When the space shuttle Challenger blasted off 28 January 1986 carrying Christa McAuliffe on board – who was going to be the first teacher in space – thousands of students in classrooms all across the country watched the lift-off. For 73 exciting seconds the spacecraft roared upward – then without warning it suddenly exploded into a huge fireball, killing all seven crew members and leaving students and teachers stunned and shaken. Photo: the explosion of the Challenger. Credit: NASA: Wikimedia Commons. 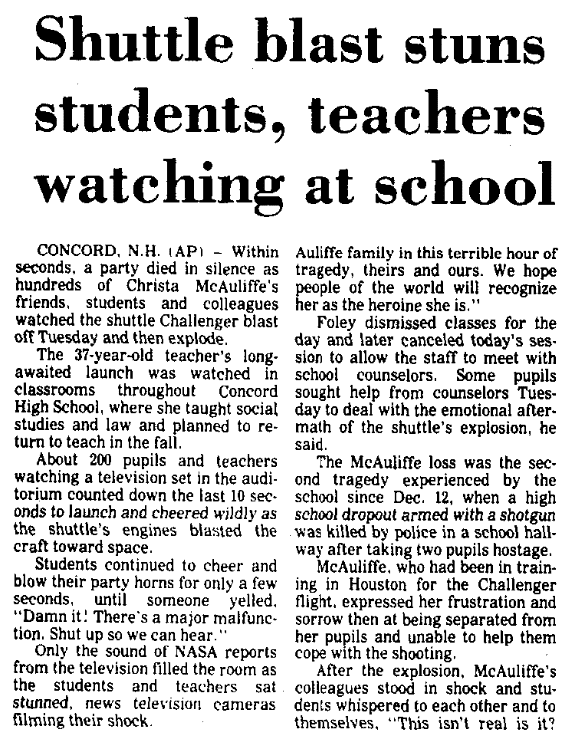 Perhaps the greatest shock occurred in McAuliffe’s own school, Concord High School in Concord, New Hampshire, where the students were watching the launch on television and wildly cheering until disaster struck. The following article reports on the grief the students, faculty and staff at Concord High School felt that day, along with two accompanying articles reporting the reaction of other teachers who had applied for the “Teacher in Space” program. CONCORD, N.H. (AP) – Within seconds, a party died in silence as hundreds of Christa McAuliffe’s friends, students and colleagues watched the shuttle Challenger blast off Tuesday and then explode. The 37-year-old teacher’s long-awaited launch was watched in classrooms throughout Concord High School, where she taught social studies and law and planned to return to teach in the fall. About 200 pupils and teachers watching a television set in the auditorium counted down the last 10 seconds to launch and cheered wildly as the shuttle’s engines blasted the craft toward space. Only the sound of NASA reports from the television filled the room as the students and teachers sat stunned, news television cameras filming their shock. Foley dismissed classes for the day and later canceled today’s session to allow the staff to meet with school counselors. Some pupils sought help from counselors Tuesday to deal with the emotional aftermath of the shuttle’s explosion, he said. The McAuliffe loss was the second tragedy experienced by the school since Dec. 12, when a high school dropout armed with a shotgun was killed by police in a school hallway after taking two pupils hostage. McAuliffe, who had been in training in Houston for the Challenger flight, expressed her frustration and sorrow then at being separated from her pupils and unable to help them cope with the shooting. “People were so high up and now they’re down so low,” said 16-year-old Craig Burbank of Concord. “A lot of us had gotten tired of all the space shuttle and Christa hype, but no one wanted anything to go wrong,” said another Concord High student, Mark Letalien, 16, of Concord. Many of Concord’s 30,000 residents were glued to local TV screens, including colleagues of McAuliffe’s husband, Steven, a lawyer who witnessed the crash firsthand from the Kennedy Space Center. Edward Shumaker, a member of Steven McAuliffe’s firm, was interviewing a witness in federal court when the judge recessed the case for the day. Shumaker, a close friend of Steven McAuliffe, broke down upon the news. “I can’t say anything,” Shumaker said, tears streaming down his face. Another member of the firm, Mark Broth, said no one had considered McAuliffe to be in danger. Broth said Steven McAuliffe never seemed worried when he had been asked in interviews about the danger. “It was mostly jokes about him being ‘Mr. Mom’ while Christa was in training,” Broth said. AIKEN – Mike Farmer was teaching a physics class Tuesday at Greenville County’s Riverside High School when he learned the space shuttle Challenger had exploded with teacher Christa McAuliffe on board. The news perhaps hit him a little harder than other teachers, including several in Aiken County, who were witnessing one of their number make history: Farmer, as one of the two South Carolina finalists in the Teacher in Space program, had met Mrs. McAuliffe last year in Washington, D.C., during the program’s final selection process. Farmer, a chemistry and physics teacher, spent a week in Washington mingling with the other finalists and discussing what the program would mean to teachers across the country. And while they never met Mrs. McAuliffe, Aiken County teachers who had vied for her seat on the shuttle said they felt the loss as well. Angela Burkhalter, another Aiken teacher who applied to the program, said she began to think about how much she had in common with Mrs. McAuliffe after hearing news of the explosion. Despite the tragedy, Farmer said he would take a shuttle trip if given another chance. The tragic launch of the space shuttle Challenger had additional significance for several Augusta educators, because Christa McAuliffe was one of them. Mrs. McAuliffe, who was to be the first teacher in space, was killed with six other members of the flight crew when the spacecraft exploded shortly after takeoff Tuesday. “I know the whole world is grieving, but this was a teacher,” said Nancy Cisick, lead teacher at Hephzibah Elementary School. “My mind is only on her. I just can’t stop crying,” even hours after the accident, she said. Mrs. Cisick was watching the television coverage of the launch at home, as Richmond County’s schools were closed Tuesday because of severe cold weather. The tears began when the shuttle exploded, she said. Then she got on the phone. “I just went through the phone book, calling any name I could think of,” she said. Mrs. Cisick said she was among 11,000 applicants for National Aeronautics and Space Administration’s Teacher in Space Project, but that she dropped out of the process at the second phase because of the amount of paperwork it involved. Another Augusta teacher, Dan Funsch, who teaches math and science at Allelulia Community School, completed the application process for the Teacher in Space Project. And he said he would do it again, despite Tuesday’s accident. Funsch expects his high school-level students to come into his classroom with lots of questions today. Richmond County teachers also will have to deal with their students’ reactions to the disaster in classes today, according to Willarena Williams, the county’s Coordinator of Science, Health and Art. Fourth-grade teacher Beverly Hite already has an idea how she will discuss the disaster with her students at Meadowbrook Elementary School today. “Modern day heroes is the first thing that comes to my mind,” she said. Superintendent Dr. John Strelec said he will ask all Richmond County schools to fly flags at half-staff today. Note: An online collection of newspapers, such as GenealogyBank’s Historical Newspaper Archives, is not only a great way to learn about the lives of your ancestors – the old newspaper articles also help you understand American history and the times your ancestors lived in, and the news they talked about and read in their local papers, including more recent events. 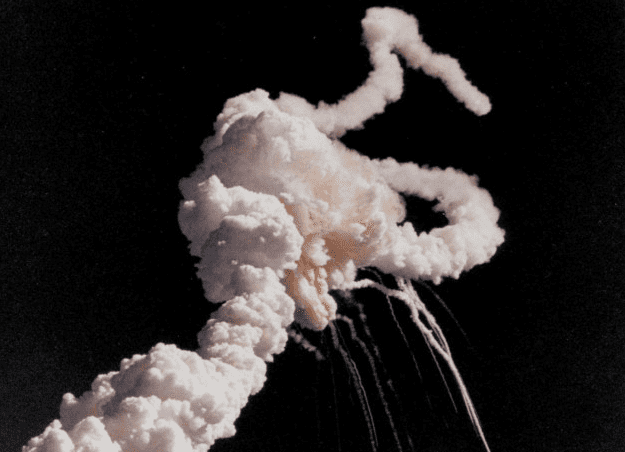 What are your memories of the Challenger disaster? Please share your stories with us in the comments section below.